Finding comfortable and safe work boots can be an arduous and quite expensive task, which is why you need to take proper care for them to make your investment and efforts count. Even though work boots, and especially safety boots with safety toe caps are made to endure strong impact, there is no need to abuse them for no reason at all. Don’t go around kicking heavy objects and materials just for the sake of it. These boots are made to keep your toes protected from accidents, and are not for kicking things for fun, because the uppers will get worn out faster than you expect. Sure, you may be tired after a long day at work, but take a few minutes of your time to make sure that your boots are clean from any mud or dirt before you go ahead and relax. Use a brush or damp cloth to carefully clean the uppers, the stitches and the soles. This will help prolong the longevity of your work footwear. If there are fabric areas, use warm water and a mild detergent to clean them properly and safely. If your boots have a strong and durable leather upper, then they need to be conditioned with leather conditioner, beeswax or mink oil on a regular basis. After you wash the boots, let them dry and apply the conditioner with a dry cloth. Rub it in and let the boots sit for the night. In the morning, wipe away any excess conditioner. Leather is a natural material, and as such needs to be treated properly, so that it doesn’t dry up and starts cracking, flaking or breaking. Also, even though your boots are water resistant, you should use an impregnator to ensure that they repel as much water as possible. To check if the impregnator still works, spray some water on them. If it doesn’t roll off the boots, then it is time for a new waterproofing treatment. 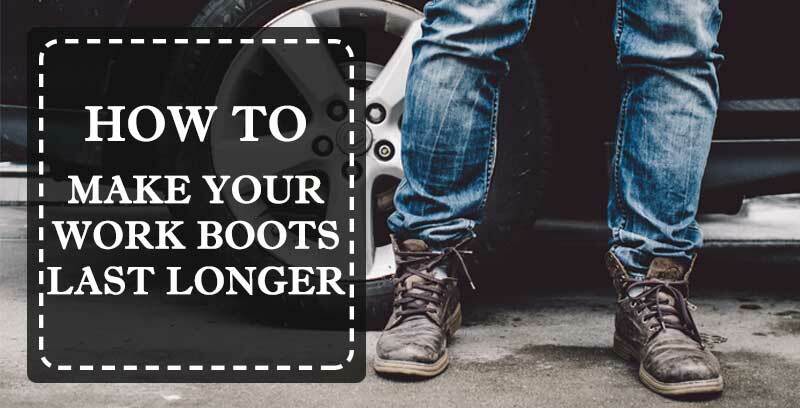 Always loosen the laces enough, so that you don’t have to tug the boots on and off like pull-on work boots. The kicking off and pulling on will damage the structure and the eyelets faster. Sure it will take a minute or two, but make sure you loosen up those laces next time you take your boots off or are putting them on. If your boots are wet, make sure you stuff them with newspapers for a while so that as much water as possible is absorbed faster. Let them dry off completely, but never near a heat source or under the direct bright sunlight. Excessive heat will cause the leather to dry up which can lead to permanent damage. Let them dry for 24 hours before wearing them again. Even if they are not wet, let your work boots air out in an area with good air circulation. Remove the insoles so that they can dry from all that perspiration. If your insoles are worn out, simply replace them with new ones. You can buy comfy, cushioned and supportive inserts which will add extra comfort to your boots. You can increase the life of your work boots if you rotate them with another pair. Having a replacement pair of boots will allow the other to dry off and air out completely. Also, after conditioning them, they will have time to absorb the conditioner completely if you let them sit for 24 hours. Having an extra pair of work boots will also help reduce the blistering and discomfort during the break in period. If you have boots made of performance leather or another alternative, breathable and flexible material, you will need to take regular care of them too, but they require much less maintenance than the leather ones. You need to clean, condition and polish them, but not as often as leather, suede or nubuck work boots. If you take the time to take proper care for your boots, these efforts will pay off in the long run! Your boots will last longer, which will save you money. It will also help delay the arduous task of finding the best new work boots. Finding new work boots which are comfortable and provide the safety needed for your job can be a daunting mission, not to mention the break in time which most work boots require, which can be quite uncomfortable an painful.